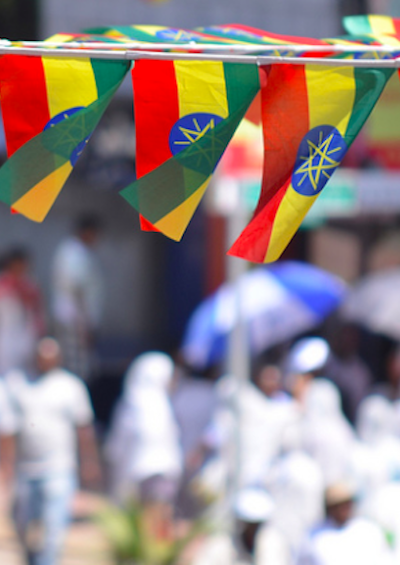 Since November 2015, Ethiopia has been beset by an unprecedented wave of protests. They began as a rebuke to a government plan to expand the municipal boundaries of the capital, Addis Ababa, into Oromia Region. They have since expanded to the neighboring Amhara Region, underscoring decades of grievances against ethnic marginalization and authoritarian rule by the governing Ethiopian People’s Revolutionary Democratic Front (EPRDF). The regime has responded aggressively. Human Rights Watch reports upwards of five hundred people have been so far killed in what the United States has decried as an “excessive use of force.” Tens of thousands more have been detained. An unexplained fire on September 3 in Kilinto prison in which hundreds of political prisoners are housed killed at least twenty-three. Rather than backing down, however, the protesters are gathering steam. The unrest has opened a pandora’s box of institutional and ideological contradictions that strike at the heart of contemporary Ethiopian statehood. Understanding these issues is essential for an understanding of the unrest now gripping the country. “You cannot remove the ethnic issue from Ethiopian politics,” Eskinder Nega, a now-imprisoned Ethiopian journalist and democracy activist, told me in 2010. At the time I was an overeager doctoral student living in Addis Ababa and researching Chinese investments in the country. I had been introduced to Eskinder by a university professor, and he was kind enough to indulge (and endure) the inquisitive pepperings of a graduate student. Ethiopia is made up of nine dominant ethnic groups and approximately eighty others. Historically, the Amhara people—of which Eskinder is a member—were the country’s governing force. Emperor Haile Selassie, Emperor Menilek (1889–1913) before him, and Mengistu Haile Mariam’s Derg regime (1974–89) after him were all Amhara. Each sought to establish a unified Ethiopia with Amharic as the official language and the Amhara culture as the foundation of Ethiopian identity. All other identities were to be eliminated—either by way of assimilation, or by force. In this the Derg was especially merciless. It perceived ethnic diversity as a threat to state unity; through its Red Terror campaign, it brutally slaughtered over five hundred thousand people—all, in its eyes, enemies of the Amhara state. The policies of the Derg were especially damaging to the population of Tigray, a tiny region in the northernmost part of Ethiopia along the border with Eritrea. Today, the Tigray make up a mere six percent of the population. Government brutality, lack of economic opportunity, and prohibitions on labor migration left the Tigray ethnically and economically isolated. Years of repression ultimately gave way to resentment of the Amhara and, by extension, the state. It also gave rise to what Ethiopian historian Gebru Tareke calls “dissent nationalism,” and the emergence of ethno-nationalist groups like the Tigray People’s Liberation Front (TPLF). For the TPLF, the state was an oppressive and colonizing force from which the country’s ethnicities had to be liberated. In 1975 the group waged what amounted to a secessionist struggle: its 1976 manifesto established “the first task of the national struggle will be the establishment of an independent democratic republic of Tigray.” When in 1989 the TPLF, then already under the direction of Meles Zenawi, successfully overthrew the Derg and in 1991 merged with three other political factions to form the EPRDF, Ethiopia was subdivided into nine mostly ethnic regions, each with the right to independent lawmaking, executive, and judicial powers. Enshrined in Article 39.3 of the constitution is the right of all ethnicities to “self-government.” Ethnic communities ostensibly inherited Ethiopia. The catch, of course, is that the EPRDF believes the only mechanism capable of ensuring sovereignty for each of the country’s ethnicities is the EPRDF itself. Relations between the central government and the regions have over the years become so centralized, and local authority so emasculated, that the de jure premise of the modern Ethiopian state—ethnic federalism—is meaningless. Contemporary Ethiopia is a shining example of the ancient dictum, repeated throughout the ages, dÄ«vide et Ä«mpera—divide and rule. Further complicating the narrative is the fact that the EPRDF—in which the TPLF remains the dominant force—has never fully surrendered its vision of an independent Tigray. The 1976 manifesto has never been revised. In this way, decades of Amhara control have given way to decades of Tigray control. The presidential office, the parliament, central government ministries and agencies—including public enterprises—and financial institutions have since 1991 all been controlled by the TPLF. So too the military. 99 percent of Ethiopian National Defense Force officers are from Tigray; 97 percent are from the same village. Only the prime minister, Hailemariam Desalegn, is not Tigray: he is Wolayta, an ethnic group that forms the majority of the population in the Southern Nations, Nationalities, and People’s Region (SNNPR). His historically close ties to Meles, first while President of SNNPR, then Deputy Prime Minister and Minister of Foreign Affairs, have, however, effectively rendered him Tigray by association. The EPRDF’s governing ideology, “revolutionary democracy”—a curious concoction of Marxist, Maoist, and ethno-regionalist thought—demands Soviet-style submission to the Tigray-dominated state. It calls for communal collective participation and democratic centralism. Through gim gima, nationally publicized government evaluation sessions, the regime weeds out dissidents and indoctrinates citizens. Following the regime’s violent clampdown during the disputed 2005 elections, the EPRDF published a booklet entitled Democracy and Democratic Unity that it used nationwide gim gima to explain away its brutal response. The booklet gave Ethiopians a “clear choice between dependency and anti-democracy forces” (i.e. opposition parties) and “revolutionary democracy (peace and developmentalism).” Rather than participants in a liberal order, then, Ethiopian citizens are mobilizing apparatchiks for the vanguard party. And since 1991 they have been subject to the diktats of one ethnic (minority) group. Resistance has been met with imprisonment, or worse. If, as William Davidson writes, today’s protests “seem to be taking on a worrying ethnic tinge,” that is because they have been ethnic from the start. Politics in Ethiopia is inherently ethnic. Of the EPRDF’s most beloved methods of centralizing control is through the centralization of land—land grabbing—which has become a rallying point in the current turmoil. While it is foreign firms in Ethiopia who are generally accused of expropriating land, the blame in fact lies with the EPRDF. A 2009 government regulation gives the EPRDF full control over all aspects of land investments over five thousand hectares (approximately 12,350 acres), including the right to expropriate land from the country’s regions and transfer it to investors. Under Ethiopian law all revenues, taxes, and associated infrastructure resulting from the investments now accrue to the EPRDF. Previously, real estate transactions had been handled by each of the country’s nine regional governments. As Chatham House, a London-based think tank, notes, “it is the state that stands to reap the most significant gains.” But the factors underpinning the government’s land grabs extend beyond simple economics: they are also a means for the TPLF-dominated EPRDF to realize some version of an independent Tigray. The seizure of large tracts of land is a process of re-concentration and of the marginalization and disempowerment of Ethiopia’s (non-Tigray) ethnic groups. Theoretically at least, it is intended to forge greater dependence on the central state and to render it increasingly difficult for rebel groups to emerge and operate in lowland areas. Most projects are concentrated in Benishangul-Gumuz, Gambella, SNNPR, and northern Amhara—remote regions of the country where government processes of assimilation and integration are ongoing. By commandeering the land, the EPRDF hopes to speed them up. Violent attacks carried out by Ethiopian protesters on Dutch, Israeli, Indian and Belgian-owned farms in Amhara in early September therefore did not target foreign interests in the country per se, but EPRDF efforts to strip Ethiopians of land and identity. Foreign firms were the unfortunate middlemen. For the better part of the last quarter century the EPRDF has attempted to whitewash its ethnic ambitions with its economic development agenda. Ethiopia is at the heart of the “Africa rising” narrative and has succeeded in lifting millions out of extreme poverty, cutting child mortality rates, and overseeing an impressive decline in HIV/AIDS-related deaths by 50 percent. Some argue that rather than ethnic tensions, the protests reflect mounting frustrations with an uneven distribution of the economic pie. This is undoubtedly part of the story. Yet as unrest engulfs places like the Amhara capital, Bahir Dar, and Adama, Oromia’s most vibrant city, which have benefitted from economic growth, it is clear that economic grievances are secondary. When in 2010 Eskinder told me, regrettably, that Ethiopia has become “the world’s star backslider,” he did not mean this economically. He meant in terms of governance and in terms of statehood. “Meles’ rule,” he said, “is not only that of the party but of the ethnicity. Meles’ relatives, friends, et cetera are putting pressure on him not to give up control because he would be giving up the control of the entire Tigray people.” This rings true of the TPLF today. This is what makes the Ethiopian unrest so significant—and potentially dangerous. At the heart of the protests is the fundamental question of how to build a modern nation state on the back of ethnic fault lines that have been exploited over centuries. Through its formula of ethnic federalism and revolutionary democracy the EPRDF has merely succeeded in repeating the errors of its predecessors through different means. In many respects the state-building question has gone unresolved; Ethiopia’s crisis is largely an existential one. In the coming weeks Hailemariam Desalegn will likely attempt peace by announcing a redistribution of government investments. Most—if not all—political and economic power will remain vested in the TPLF. While this may quell the protests for a time, without genuine attention to the country’s conflicting institutional and ideological challenges—central to which is the dominance of the TPLF and the Tigray—the situation is likely to get worse before it gets better. All that is at stake, is everything. Aleksandra W. Gadzala is an independent political-risk consultant based out of Boca Raton, FL and an Africa contributor with Oxford Analytica. She holds a PhD in Politics from the University of Oxford.